Donnie Miller has it all: beautiful wife and son, perfect home in the wilds of Saskatchewan and the sort of comfort that comes from having a rich father-in-law who is generous to a fault with his daughter and grandson. It’s a far cry from his poor upbringing in Glasgow and Donnie lives with the constant fear that none of it is real, that it will be taken away from him in the blink of an eye, that it’s much more than he deserves. Donnie Miller has a long-buried secret, a life that he has worked hard to put behind him. As winter settles in, the family dog disappears. When it turns up horribly mutilated, the cracks in Donnie’s life start to appear. When the heavy snows start to fall, cutting him and his family off from the nearest town, Donnie discovers that he’s about to lose more than just the dog. Cold Hands is something of a slow-burner, to start. Told from the first-person point of view of Miller, we meet the man and his family, and quickly come to understand the dynamics that drive this small family unit. The mutilated dog turns up early on, and seems shockingly out of place in this snow-covered idyll, giving us a glimpse of things to come. The narrative is frequently interrupted by flashbacks – descriptions of Donnie’s childhood, and his friendship with Banny, the school bully – and we quickly learn that there’s a secret, something bad enough to warrant a new identity and a new start outside of Scotland. There is something jarring about these flashbacks – the shift in accent and language, the violence – but it is a feeling that serves the story well, and never reaches the point of distraction or irritation for the reader. Towards the middle of the book, Niven begins increasing the tension, and the final third is an intense, breath-taking read, that always keeps the story’s main themes in sight, and is never anything less than completely realistic. As many writers have done before him, Niven uses snow as the catalyst for the action in the novel, and the combination of snowstorm and isolation as the enabler for Miller’s persecution (The Shining, anyone? 30 Days of Night?). It’s an old trick, but with fantastic results: a tense thriller designed to keep the reader turning the pages long after bedtime; at its core, a character who does not necessarily deserve our sympathies, but who receives them nonetheless. At its heart, Cold Hands is a story about parenthood, and an examination of the inherent insanity that comes with it. To what lengths would a parent go in order to protect their child? Or to avenge them? It’s an added dimension that speaks directly to parents, leaving behind an uneasy feeling and a desire to keep the children home, wrapped in cotton wool at all times. Don’t worry, though, there’s plenty here for everyone, and Cold Hands should appeal to anyone who prefers their action heroes more in the vein of John McClane than of Rambo. 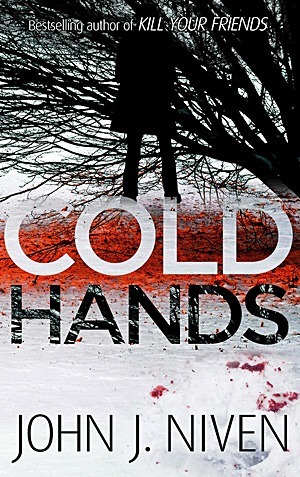 Cold Hands is John Niven’s first foray into crime/thriller territory (hence the addition of the middle initial), and shows a writer who is more than up to the task. There were points (particularly during the flashback scenes) where I had to remind myself that I wasn’t reading an Iain Banks novel, but Niven’s own voice is readily apparent for the bulk of the narrative. The settings are beautiful, and Niven does an excellent job of putting the reader in the middle of that cold, snowy Canadian wilderness, and into the heart of the action. It’s also worth noting that he does not pull his punches, and that this is not a book – despite appearances in early chapters – for the faint of heart or stomach. From its slow beginnings to its violent and blood-spattered conclusion, Cold Hands is a good old-fashioned thriller. With a handful of twists designed to keep the reader on their toes, Niven’s first thriller is an intense and gripping examination of one man’s determination to protect his family from a past he has long forgotten. This is thriller writing at its best, and John J. Niven is definitely one to watch in a genre that can, at times, suffer from saturation of offerings.